Jens Bergensten, the lead designer for MineCraft over at Mojang, says that after the delay that update 1.5 faced, fans can expect MineCraft to see the update in early March. Dubbed as the Redstone update due to the number of changes the mechanic, this update was first announced last November at MineCon 2012. In addition to new changes for the redstone mechanic, there will be fixes to the game, support for HD texture packs, a scoreboard and a tweaked inventory system among others. 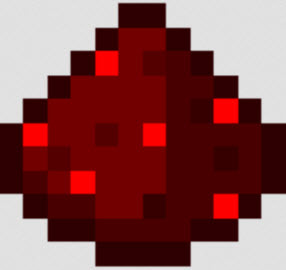 Redstone is a very important ingredient in both crafting and brewing, though the former is probably the most common use for it. Using an iron pickaxe or better, players can get redstone dust by mining the ore deep below the earth. Alternatively, redstone dust drops by killing witches or trading with priest villagers. The reason the ingredient is so popular is because players can put down the dust on the ground to create redstone wire, which links together devices much like hobbyist circuitry. Redstone can be crafted into redstone repeaters and torches, which help create elaborate traps, door locks and other interesting automated devices. Truly, it’s a unique material found in this game as it provides power to objects and wires. MineCraft’s 1.5 update is dubbed the Redstone update due to the large number of redstone-related objects being added to help create even more complex devices; considering players have already been able to create things like a working binary calculator, imagine the possibilities that these new inclusions could mean. Originally announced as the capacitor, the redstone comparator is a block designed specifically for redstone circuitry. With two inputs — signal A in the back and signal B in the side — this creates new possibilities for those experimenting with wiring. The device works sch that there is no output when signal B is stronger than signal A. Otherwise, it is possible to repeat the A signal at the strength it has or output the difference in subtraction mode. One way this can be useful is as a diode. Own its own, the comparator can be used as a diode with a delay of half a tick, putting out the same amount of strength as the input but without letting the current flow against the arrow. To craft this, players will need three stone, three redstone torches and a Nether Quartz. The output can be toggled by right-clicking the unit. All containers put out a signal if the player puts out a redstone comparator beside it. The strength of the signal depends on how many objects are in the container and what disc number the Jukebox uses. This can also work with trapped chests, meaning it is possible to have two different signals at once. Bound to be added in update 1.5, the hopper is a block that moves items in and out of containers. When it is placed down, the output side attaches to a block; should the item fall above it, the hopper stores it within its own five-slot inventory. However, if attached to a container that has its own inventory, whether it be a chest or another hopper, then the item gets transferred to the other object at a rate of 2.5 items per second, or 8 game ticks. To craft a hopper, a player needs a chest and five iron ingots. This tool allows one to automate the process of collecting a drop, and placing a comparator adjacent to it will cause redstone signals to emit. One item gives it 1 signal strength while a third of a stack — 21 items that normally stack to 64 — gives it a signal strength of 2. A full stack gives 3 signal strength. Crafted with a single redstone and seven cobblestone, the dropper is a new block introduced into MineCraft update 1.5 that drops something from its inventory whenever it is powered. If there is a chest adjacent to its front, then the dropper will transfer the item to the chest instead of dropping it as an entity. It’s also possible to drop items through glass blocks set in front of it. This differs from a dispenser as it simply drops the item; dispenser will shoot an item outward and can cause damage. The dropper can be placed in any of the six possible directions, but it requires a redstone signal in order to drop anything. Though the previously mentioned blocks are definitely the highlight of this update, they are far from the only things being added to the game. Made up of three wooden slabs, three glass blocks and three Nether Quartz, the daylight sensor puts out a signal strength that depends on how intense the sun is shining. Rain will not affect this, and neither will glowstone or torches — only the sun will work. This allows solar-powered systems to exist within the game. Using a chest and a tripwire hook, players can create this device that gives out a signal depending on how many players look inside. Large trapped chests can hold more storage staggered with large chests. The texture differs somewhat from a normal chest as a red stain appears on the latch, giving away its trapped status. Building upon the existing pressure plate, this is used to detect items dropped on it. The light version, made of gold, reaches full strength with 60 items. The heavy iron version requires 10 times this. It is also linear, so having 10 strength means twice the strength of a 5 strength signal. Much like other blocks, this is crafted with nine of its own kind; in this case, it’s redstone. This acts as a means of storing redstone and will also emit a constant signal. This makes it a good source of power that can be pushed. By breaking or smelting Nether Quartz ore, players can receive this material, which is an ingredient for crafting redstone comparators and daylight sensors. Alternatively, it can be crafted into blocks for decoration. The former can be obtained by smelting Netherrack, while the latter can be created by piecing together four Nether bricks. Found in the world, these can be mined to receive a single Nether Quartz item each. They can also be smelted to obtain the same Nether Quartz. In addition, it is possible to use the Silk Touch enhancement to obtain the material, and players can use the Fortune enhancement to drop more ore.
A decorative block, players can craft this by piecing together four Nether Quartz blocks to form a square on the crafting grid. Crafted using six iron ingots, a redstone torch and two sticks, this is used to trigger a minecart that has TNT put into it. This can also be used to stop items from passing onto a minecart with a hopper in it. In either case, redstone is required to power the device as it transmits a signal to up to eight rails before requiring more power. Using a minecart and TNT, players can create this explosive danger on wheels that ignites via activator rails. The faster the cart goes, the more violent the explosion will be, though it will never destroy the supporting blocks and rails. It can destroy redstone materials at range, however, so this is something to be wary about. Mixing a minecart and a hopper, this device can pick up items from containers as it passes over, but it can only be emptied by driving over a hopper. There are far too many details than can be jam-packed into one place, but these are the most important additions to be found in update 1.5 for MineCraft.